This article gives you complete information about tennis game. This article includes scoring rules and equipments used in tennis game. Details about Court dimensions of tennis game are also quoted in this article. Tennis is the Luxurious racquet sport in the world compared to other racquet sports. Tennis game is played as singles as well as doubles. 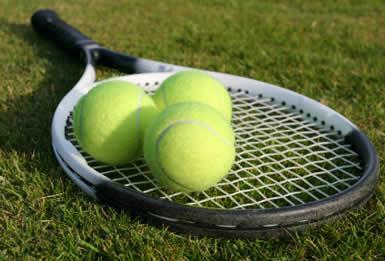 According to the study Lawn tennis is originated from Birmingham, England in the 19th century. Wimbledon is the famous Tennis tournament in the world. Softball and racquet is used for playing the tennis game. Tennis was approved as a Olympic game from 1896. The highest organizer and governing body of tennis is International Tennis Federation. Novak Djokovic is the No 1 player in 2011 Men's Tennis ATP Rankings and Caroline Wozniacki is the No 1 player in 2011 Women's Tennis WTA Rankings. The first Wimbledon Championship was held in 1877 at London. Tennis game requires more power and strength as it is along time game with many sets. US open is one of the famous grand slam tournaments in Tennis and Wimbledon is the oldest Tennis tournament in the world. Different courts are used for playing Tennis game like Clay court, Hard court and grass courts. Different tournaments are played in different courts. 1) There will be a toss before the game where the player who wins the toss can choose serve or receive serve or choose the court. 2) In tennis scoring, there will be "game", "set", and finally "match point"
3) To win a game the player must take 4 points starting from 15, 30, 40 and game. if it is a deuce (40 - 40), the player has to score 2 points ahead of other. 3) A set include six games and the player must have two set ahead of other player to win the set. If it is a tie, the set will be decided on tiebreaker. 4) Two sets are required to win a tennis match for women and three set wins are required for men in tennis. 5) According to the latest rule Player can challenge for the point, if he thinks the referee had made a mistake. Racquets and softball are the main equipments for playing tennis game. More information is given below. Racquet is the important Equipment used for playing tennis game. The strings of Tennis racquet will be more tight while compared to other Racquet games and high quality strings are used for gutting. Tennis racquets are generally made of Graphite, titanium and lighter metals. The grip of the Racquet determines the handling control of the Bat. Wilson is the best and leading producer of tennis bats. Tennis racquets should not exceed 29 inches length and 12.5 inches width. Tennis balls are similar to soft cricket balls but it is having less weight. Soft rubber is used for making Tennis balls. There will be a soft coating in tennis balls. As per the rules, Tennis balls must be made in yellow or white in color with 6.7 cm diameter. According to the rules of International Tennis Federation (ITF), tennis balls should be made in a weight between 56 to 59.4 grams. If the ball is made in a wrong manner like its weight and size, it will adversely affect the Tennis game. Shoes and grips are also part of Tennis game. Tennis shoes is different from normal shoes as it need more grip and less weight. A good tennis shoe will provide a good control for the players in Tennis. Handgrips and racquet grips are also important while playing tennis game. Racquet grip determines the control and handling of the racquet. A better grip will give more easiness while playing the tennis game. Quality grips must be used for Racquets. Tennis court is divided into two half's with a net in the middle. The dimensions of the tennis court will be different in singles and doubles game. The length of the court must be 23.77 mtr for singles and doubles. Width of the court should be 8.23 for singles and 10.97 for doubles game. The tennis net will be 1.07 mtr high from the ground.